Recruiting students to our universities should be easier than ever with the help of technology. Our millennial school leavers begin their search for their chosen course or institution long before any application form is filled in and will conduct their research via the same method that they’d search for most things in the year 2019 – online. That presents an overwhelming opportunity for any digital-savvy university to start enticing the brightest kids to join them at the earliest opportunity. It does, however, require clear vision for what the future of our universities looks like based upon the technology available, and it also requires significant resources to make the necessary changes. Those universities that create a unified digital culture right across their institution including the use of social media, VLEs, the university website, email, apps, intranets and all other content accessible via any device will attract the best applicants and lay the foundations for retaining them once they join. It demonstrates the institution’s intention to its prospective students to be a leading, creative, forward-thinking digital university that students will not just want to join – but will want to remain in through to successful completion of their course. Starting the digital recruitment early undoubtedly impacts retention and longevity of the student life-cycle. A joined-up approach is what is needed and demanded by the modern student generation. This is the generation that uses social media ubiquitously and can be communicated with more easily and hooked into the student life-cycle earlier than previously. The task for the university is how best to engage and spark their interest and then keep hold of it through admissions and beyond. Many institutions are exploring putting new technologies to best use to help do just this. Virtual reality has been one area that has seen some application in terms of recruitment. 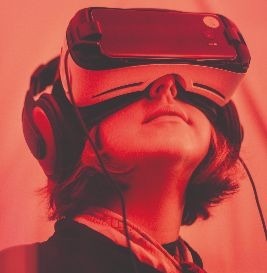 School leavers can use VR technology to look around their choices of university and gain a virtual tour of a campus and experience what it might be like to attend. Far from the tour being a substitute for visiting in person, it’s there to complement it, to revisit it virtually and to go back over areas you may want to take a deeper look at. And for those students who live further away and maybe aren’t able to attend in person, virtual reality offers an opportunity to do something that otherwise may be impossible. Such virtual tour apps will be downloadable to any smart device, and as new content comes along, this can be added to the app and updated for new viewing – keeping school leavers coming back for more. Once recruited to the university, technology offers the institution the opportunity to improve student retention by focusing on personalisation and increased engagement based on the data that a digital campus can provide. Academic progress, interaction with the digital campus and action analytics all provide a way for academics to intervene to help students when they need it most based upon predictive models of success. Adaptive courseware and competency-based education also offer the potential of a personalised way to credential completion. If students can see their personal progress mapped out ahead of them, and the institution can provide the guidance required at the points it’s needed most, it increases the chances of students sticking to their goals. At the most basic of levels, technology removes ‘friction tasks’ in a student’s day and helps ease their path to success. It frees up time for face-to-face interaction to be more valuable, allows students to collaborate and support each other more easily, provides a close link to academics via video, webinars and audio recordings helping build a sense of connection and belonging between students, the institution and their peers. This increases engagement, delivers student retention and provides success for both student and university. How will higher education help to make our cities smart?